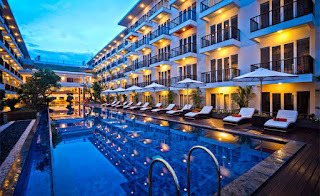 The Jimbaran View is the highest hotel in Bali with 360 degree view. The location only 600 meters south of Garuda Wisnu Kencana Culture Park on Jl. Raya Uluwatu, Jimbaran, 15 minutes from Air- port Ngurah Rai, and from surf spot in Jimbaran area. This hotel with 245 rooms and suite rooftop bar and lounge, swimming pool, business center, spa, restaurant, boutique and kids club.